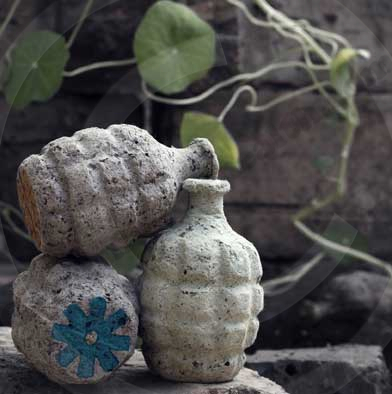 SEEDBOMs are friendly bombs that contain all the necessary nutrients to grow flowers virtually anywhere! Tools for eco-warriors and guerrilla gardeners in the war against neglected neighbourhoods and weary wasteland. So get outside, join forces with nature and revive dull and lifeless places with an explosion of life and colour. Used office paper, used egg boxes, natural plant waste bi-products, organic peat free compost, organic fertiliser, and not forgetting easy to grow and UK native flower seeds! They are eco-friendly! Produced in the UK from locally sourced reclaimed, recycled and organic materials seedboms are made from things that would otherwise end up in landfill sites across the UK. The nice thing is that seedboms biodegrade into the environment over time and so we are returning the materials back to nature, leaving only flowers behind. They grow! Seedboms make a visible impact to any area where they are grown. They brighten up dull and lifeless areas and you don’t even need to be a gardener to grow them! They are fun! You can get together with a group of friends or family and seedbom a site of your choice or even simply plant them in your garden or in pot by your window and watch them grow every day. Like all the best things in life seedboms require a bit of love and attention. You can simply throw your seedboms into a derelict site and forget about them but show a little care and attention to your seedbom and watch it grow from a little seedling to a strong and healthy plant. Keep them damp, make sure they have enough heat and sunlight and nature will do the rest.